The Cyprus topped the Brand finance’s best performing or fastest growing nation brands list with a change rate in performance growth of 39 per cent from the year 2017. According to UK-based brand valuation consultancy Brand Finance’s Nation Brands 2018 report, the Cyprus topped the list with a change rate in performance growth of 39 per cent from the year 2017. D.R. Congo (38%), Egypt (37%), Kenya (37%), and Tanzania (35%) came in 2nd, 3rd, 4th and 5th respectively. 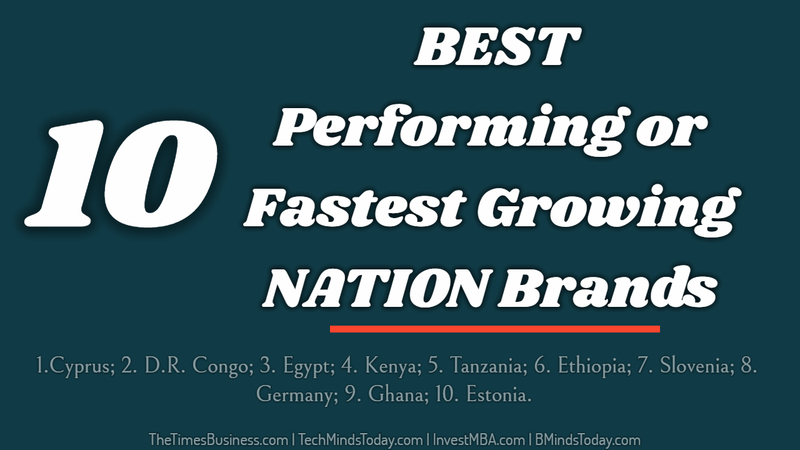 Six out of ten fastest-growing nation brands this year are from Africa. Democratic Republic of the Congo, Egypt, Kenya, Tanzania, Ethiopia, and Ghana have all recorded outstanding growth between 28% and 38% year on year. 1.Cyprus; 2. D.R. Congo; 3. Egypt; 4. Kenya; 5. Tanzania; 6. Ethiopia; 7. Slovenia; 8. Germany; 9. Ghana; 10. Estonia. Brand Finance measures the strength and value of the nation brands of world’s leading economies using a method based on the royalty relief mechanism employed to value the World’s Largest companies.